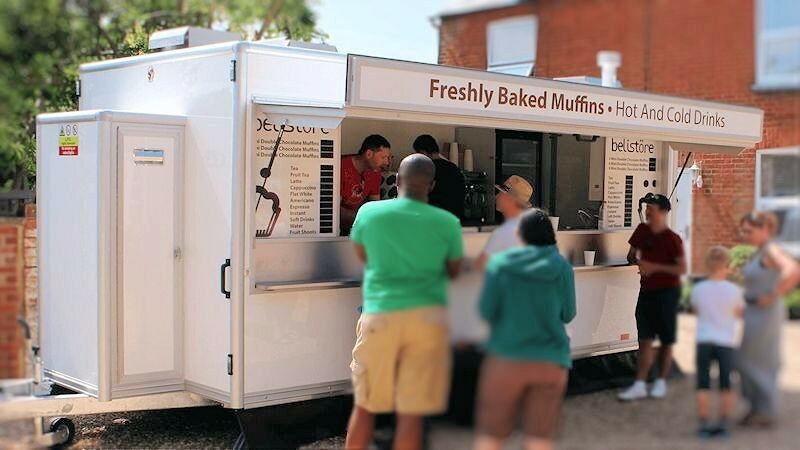 belistore, based in Milton Keynes, is a purpose-built mobile kitchen and catering store, baking a mouth-watering range of cakes and pastries on-site, to give guests and consumers the freshest goods possible. Start the day right- the pleasant aroma of cinnamon swirls, along with a selection of other pastries cooking in the oven, combined with freshly ground illy coffee, just waiting to be drunk. You can find us at our regular weekday location at Davy Avenue, Knowlhill, Milton Keynes MK5 8PL between 07:30 and 15:30. The mid-morning and afternoon air fills with the unforgettable smell of rich Belgian chocolate, as double chocolate muffins are being born from the oven. Other familiar scents are the wild Canadian blueberry muffins, ready to excite the taste buds. Spot on for the colder months, try our Madagascan vanilla bean hot chocolate, topped with thick whipped cream and marshmallows. We also offer a range of savoury items on our specials menu, including bagels, savoury croissants and French toast. Following on from 15 years as a pastry chef in 2 red rosette establishments such as Hotel du Vin Bristol & Royal Tonbridge Wells and riverstation, Richard moved into new product development for the retailers. In 12 years he has had products launched across sweet and savoury pastry, desserts and bakery goods in Waitrose, M&S, Tesco, Sainsburys, Asda, Morrisons, Co-op, the discounters, Maison Blanc, Fortnum & Mason and foodservice. In 2013 Richard started doing event catering after seeing the huge influx in the savoury offerings with minimal fresh sweet options. 2014 saw him in ‘The Muffin Van’ making appearances at larger events – British Touring Cars & British Super Bikes at Thruxton race circuit, Bristol Balloon Fiesta and multiple events at Santa Pod Drag Strip. The muffin recipes have been developed by Richard himself. His approach was to remove the preservatives and use premium ingredients like dark Belgian chocolate chips & wild Canadian blueberries. Care is given to the preparation and mixing, and for the utmost in freshness, the baking is all done on site within the trailer. Pastries are also baked fresh, giving event and private party guests the freshest possible products. Menus for private and corporate events are written to your requirements. Served along side these are freshly ground Illy coffee, Yorkshire tea, homemade hot chocolate and cold drinks.